NEW YORK – It is seemingly impossible today to go through a checkout line without being asked for some piece of personal information. With more and more data being requested from today’s consumer, consumers want to know what they will get in exchange for this information while brands are looking to better understand how and when consumers will share their data. 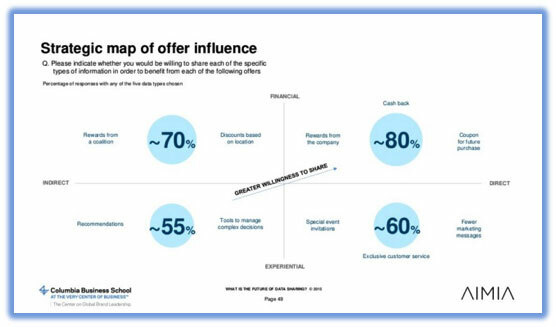 New research from Columbia Business School’s Center on Global Brand Leadership conducted in conjunction with Aimia, a data-driven marketing and customer loyalty analytics company, reveals that companies must focus on building brand trust, delivering relevant added value to consumers, and helping give people a sense of control over their data. In order to help brands identify how to build trust with consumers, the research titled “What Is the Future of Data Sharing? 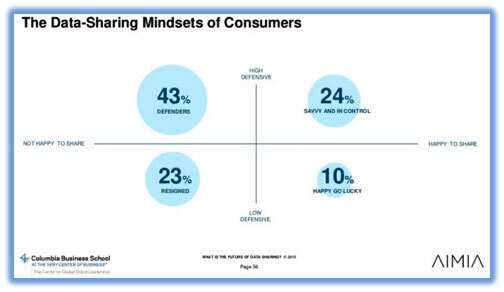 Consumer Mindsets and the Power of Brands” reveals that consumers can be broken down into four distinct “Data-Sharing Mindsets” that show how consumers perceive and act on data sharing. These mindsets reflect how happy consumers are to share data and whether they take defensive actions to limit online tracking and/or make up addresses to avoid giving away true personal information. Defenders have a negative attitude towards sharing data, and will take defensive actions to protect it from companies. Resigned have a negative attitude towards sharing data, but does not do anything to actively avoid providing it to companies. Happy Go Lucky are happy to share data with companies for added-value, and does not take any actions to avoid sharing it with companies. Savvy and In Control are happy to share data with companies for added-value, but will take defensive actions at times to protect it from companies. The Savvy and In Control mindset in particular presents a very interesting phenomenon for companies, according to Matthew Quint, director of the Center for Global Brand Leadership. In addition, the research found that companies should be thinking creatively about new kinds of offers in which consumer data directly benefits the consumer – providing security and control, building recommendation tools, even using data for societal benefits – as such efforts can help persuade people to share their data as well. The Savvy and In Control mindset were over 40% more likely to share non-required types of data to receive these kinds of benefits. With these findings, the researchers were able to draw various comparisons and conclusions across a range of consumer types (four Data-Sharing Mindsets), industries (financial services, telecom, retail, airlines, web services, and e-commerce); generations (millennial, generation x, boomers, and silent generation); and geography across the five countries. The results provide a wealth of information to brands to be able to better understand their consumers and communicate more effectively. The research was based on a survey of 8,000 consumers from the US, UK, Canada, France, and India from February 3-11, 2015. To learn more about the cutting edge research being conducting by Columbia Business School’s Center on Global Brand Leadership, and to view a copy of the complete report, please visit: http://www8.gsb.columbia.edu/globalbrands/.